Two distinct changes can occur during transfer orbit: a change in the total energy of the satellite, and a change in direction without changing the total energy. As discussed in Sec. 6.1, the total energy of a Keplerian orbit depends only on the semi-major axis. Consequently, only transfer orbits which change the mean altitude, such as transfer from LEO to GEO, require adding energy to the satellite. Clearly, if we wish to go to an orbit with a higher energy level then we must find some process to provide the additional energy, such as rocket propulsion or a lunar or planetary flyby. 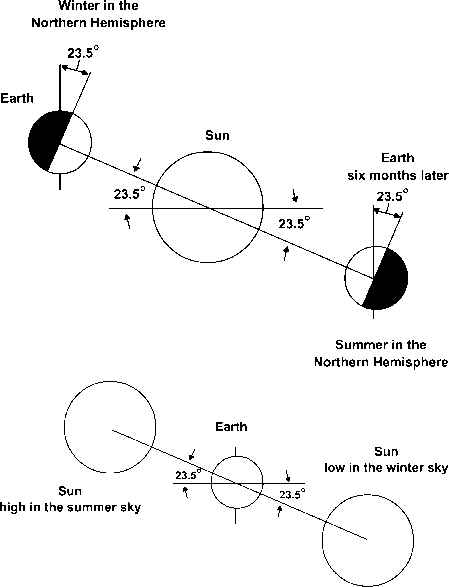 If we must remove energy from the orbit, we can frequently use atmospheric drag. A change in satellite direction without changing energy normally involves a plane change (inclination or node), although we may also change the eccentricity without changing the mean altitude. (Any small thrust perpendicular to the velocity cannot change the orbit energy, or therefore, the mean altitude.) To change the satellite orbit plane or eccentricity without changing the total energy, several options are available. If we choose to change directions by using propulsion, then propellant requirements will typically be large; the AV required to change directions is directly proportional to the spacecraft velocity, which is about 7 km/s in low-Earth orbit Fortunately, other techniques for changing the orbit plane require less energy. For example, suppose we want to shift the node of an orbit to create a constellation with nodes equally spaced around the Earth's equator or to replace a dead satellite. If the constellation is at an altitude other than that of the replacement satellite, we can use the node regression provided by normal orbit perturbations. The rate at which the node of an orbit processes varies substantially with altitude, as described in Sec. 6.2. Specifically, if we have a final constellation at a high altitude, we can inject and leave the replacement satellite at low altitude so that the node rotates differentially with respect to the high-altitude constellation. When the satellite reaches the desired node, an orbit transfer is made with no plane change, thus using much less energy. In this case we are trading orbit transfer time for energy. Because the AV required to change the plane is directly proportional to satellite velocity, plane changes are easier at high altitudes where the satellite velocity is lower. That is why most of the plane change in geosynchronous transfer orbit is done at apogee rather than perigee. If the required plane change is large, it may cost less total propellant to use a three-bum transfer rather than a two-bum transfer [Betts, 1977]. In this case, the first perigee bum puts apogee at an altitude above the ultimate altitude goal, because the apogee velocity is lower there. During a second bum, the plane change is made using a smaller AV and perigee is raised to the final altitude. The third bum then brings apogee back to the desired end altitude. This process is not more efficient for small plane changes such as those associated with launch from mid-latitudes to geosynchronous equatorial orbit A third proposed way to make large plane changes is the aeroassist orbit described in Sec. 7.3 [Austin, Cruz, and French, 1982; Mease, 1988]. Ordinarily, we want to transfer a satellite using the smallest amount of energy, which commonly leads to using a Hohmann transfer as described in Sec. 63. However, as illustrated in Fig. 7-9 and described in Table 7-9, other objectives may influence the selection of a transfer orbit For example, we can reduce the transfer time relative to a Hohmann orbit by using additional energy. These transfers are not common, but they may be appropriate if transfer time is critical as might be true for military missions or a manned mission to Mars. Fig. 7-9. Alternative Transfer Orbits. See Table 7-9 for characteristics.